The last two weeks have had a beautiful synchronicity (though I suppose that’s not really the right word as I knew both events were happening). 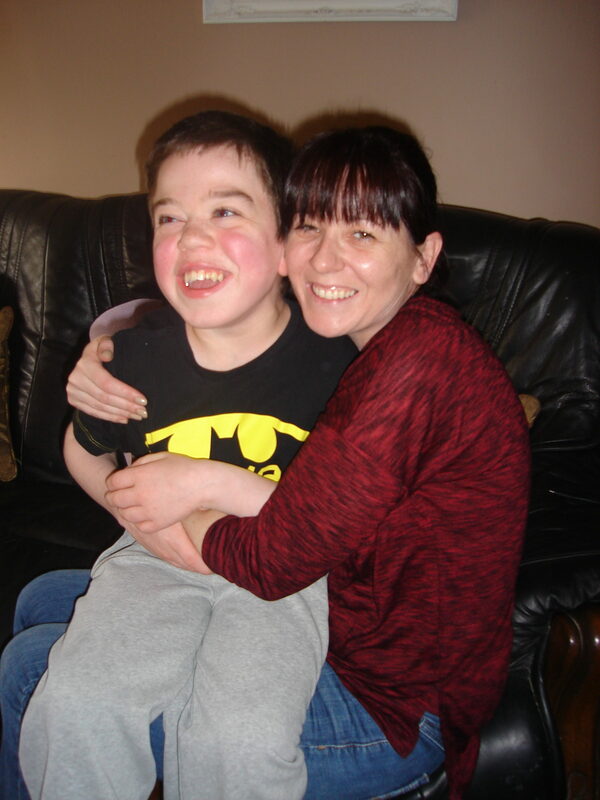 I have had the honour of meeting two lovely mothers and their sons who live with Hunter Syndrome just like my Pudding. Last week in Manchester I met up with C and her little boy who was diagnosed in July, almost a year to the day after Pudding. A few weeks after they heard the news, our specialist nurse put us in contact with each other. I’ve done my best to support her through this difficult time, letting her know what to expect and how we’ve got through the first year. I know she has also appreciated having this blog to read – making my decision to write it even more worthwhile. It was fabulous to meet her and give her a hug in person. Her boy is a little sweetie and enjoyed playing hide and seek in the ward curtains with Pudding. What she probably doesn’t realise (though will now!) is how much I too have benefited from my contact with her. It feels a little selfish but it’s as if I’m going back a year ago and telling myself the things I needed to hear, partly rewriting the horrible time when we felt so alone and isolated. Then this week I flew to Ireland to meet Geraldine and Ethan. I stumbled across Ger’s blog a few months into our own diagnosis journey, left a comment and was welcomed wholeheartedly. She introduced me to the online community and was the first person I could turn to for advice. Since then, we read each other’s writing and message a fair amount so I felt like I already knew her. We had one and a half days of wandering around her lovely hometown, drinking in the sea air and being blown along the prom, eating, shopping and talking almost non-stop. She was just as kind and funny and generous as I expected. And of course I got to meet her boys. I thought I knew what to expect when I met Ethan. He had more language than Pudding when he was little and was a whizz at jigsaws. But he wasn’t diagnosed until he was gone five and then they had to battle for six months to get enzyme treatment for him. Sadly he wasn’t able to join the clinical trial that Pudding is on. Now he’s 14. I knew his fingers would be curled in. I knew that he was using a wheelchair more and more. I knew that his language had mostly gone. I knew that swallowing certain foods was becoming more dangerous. I knew that he likes his own space and can hit indiscriminately. Mostly I worried that I wouldn’t know how to interact with him, but I needn’t have done. When he came in the door, Ethan made a beeline for me, took my hands in his gentle ones and looked directly at me. What I hadn’t known was how beautiful his eyes are and how much he still wants to communicate even though MPS is robbing him of so many things. I was privileged to sit on the couch to eat toast together and watch The Simpsons. I stroked his back and felt at peace. Deep down I have always been scared that if Pudding got to the later stages of progression in Hunter Syndrome I wouldn’t know how to connect with my own child. That I would be too horrified at the changes to recognise him and love him still. Ethan taught me a valuable lesson – that he is still very much there and lovable. I am so glad I got to meet him. Most of the time lately I’ve been able to feel very positive despite the sword of MPS hanging over us. Pudding is on the trial and we know that this could mean his future is very different from other Hunter’s boys that have gone before him. Even if the trial doesn’t work for him he would have years ahead of him. Tonight it’s a little harder to stay positive. Tonight the MPS community mourns again. Ray was 7 years old. I have a little luxury that I indulge in when we’re in Manchester if it’s a long day or we’re there two days running. Our visit last week was a long long day. There was a problem in Pharmacy making up the drug so Pudding wasn’t given his dose until three hours later than usual. If I’m stuck anywhere for any length of time I start to go stir crazy and hospitals seem to exacerbate that. There is always a lot of waiting around – waiting for the next set of observations, waiting for the dose, waiting to see if he reacts badly – and we’re powerless to really do anything much. So what I do is take a walk to the M&S Food Shop for a nice sandwich and maybe even a pudding. It is a definite improvement on the canteen food, but that’s not the luxury. No, it’s the short walk there, and more importantly leaving the building. I go the long way round and cut across the grass. Even though there are no signs saying you shouldn’t I still feel guilty but it’s worth it. The chance to walk outside and gaze at lush green nature, even if it is only a tiny patch, is priceless and is my healing. The most important people though, at least as far as the kids are concerned, are the play specialists. Nope, I hadn’t heard of them either until recently. These wonderful people have a background in childcare but now work in the hospital to offer all sorts of opportunities for play – distracting children from the procedures they are facing and supporting families. And oh my word, they are worth their weight in gold! 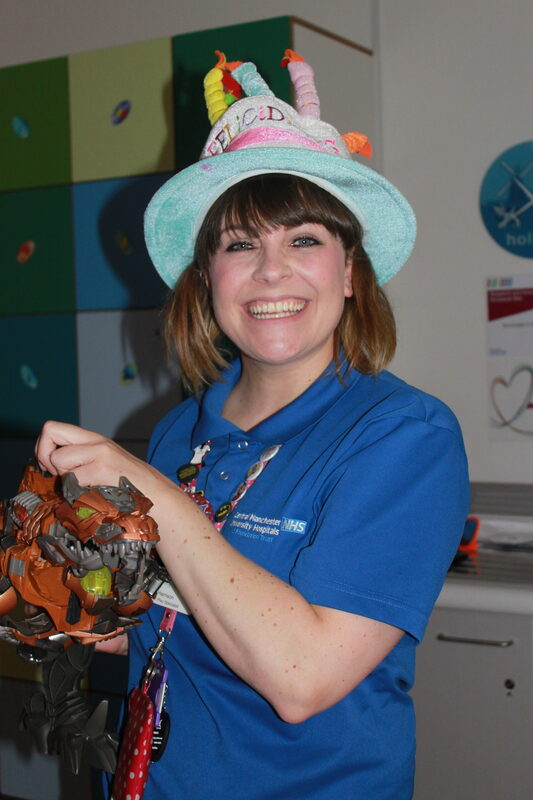 The first thing most kids ask when they get onto the research ward is ‘Where’s Emma?’. Non-verbal children like my Pudding rush to give her a hug. She makes each and every one of them feel special and loved. Of course, the nurses do a brilliant job too, but they have to focus on the clinical side and have loads of admin to do as well, so Emma gets to be the fun one. She provides DVDs, spare batteries and wifi, arranges the chill-out room for the teenagers and messy activities for the young ones. She has an enormous smile that never disappears. (And she’s even been known to clean up vomit when the need arises.) Pudding has one T-shirt that says ‘Mad as a box of frogs’ and we have always joked that she should have one too. Madcap indeed, but exactly what we need to keep us all sane in stressful circumstances. Exciting times! Yesterday was Pudding’s second full day at school. Last week he did two mornings and this week we’ve been alternating so we can ease him (and them!) in gently. Despite some encouraging transition sessions and oodles of support from school I have been nervous about him starting. Will he run riot? Will the other kids accept him? And so on, and so on. But the experience so far has been almost entirely positive. Of course I’m not saying he’s behaved like an angel. That would be too much to ask. But he has run in each morning clutching his school bag and with a big grin on his face to greet his TA – superb. He has sat down to eat his lunch most days – amazing! And I get the usual excited ‘Mumm-mee!’ and knock-me-over cuddle when I go to pick him up. It’s amusing having his big brother and cousins at the same school. So I get the official version of Pudding’s day at hand-over: that he did well on a jigsaw, that he sat down nicely at circle time or has been very enthusiastic with his painting. What do the other kids make of him? As in playgroup, many have simply accepted him for what he is and don’t seem to bother that he can’t talk to them. Others are interested and want to learn more – one little girl was very proud to be able to show her mum the Makaton they did in class. Another boy told me somewhat grumpily that Pudding always messes up his cars, but it was in a tone of complaint that he would use with any other child. I’m sure we’ll come across the whole spectrum, and that’s ok.
He’s certainly making his mark on the whole school community (which is a big one). Many other parents have asked how he is doing. And I’ve been amazed this week by the number of children who’ve said hello to him during school run; not just friends of Twiglet, Niece or Nephew – it’s been those in other years too. There are so many stories of cruelty and intolerance out there, and of course those people will always exist. Niece was riled earlier this week by a (notoriously mean) boy laughing at Pudding for still being in nappies. But the acceptance and goodwill that we have seen since Pudding started at school, has been filling up the positive side of the scales to overflowing. And how am I managing to spend my days? Well yesterday, I went into town to meet a writing friend and spent two hours working on the much-neglected novel. Followed it up with lunch, and some early Christmas shopping then walked back to the bus stop in beautiful sunshine with a grin as wide as my face…. As predicted, this summer holiday has been so much better than last. We’ve had some lovely days out/time away and respite has allowed Twiglet and I to spend time doing some more adventurous outings. And of course it has helped that we weren’t being crushed under the weight of a new diagnosis. The holiday ended with a week in a converted barn down in Warwickshire. There was a play area with Wendy house, footballs and ride-on toys. Boxes of toys to borrow and play with. Fields to either side with horses and cows. And so many great places to visit nearby with children, including Mary Arden’s Farm and Hatton Country World. I think Pudding was in seventh heaven with all these animals to meet! Then I came down with a rotten cough and spent the last three days coughing for Britain and wishing I was at home. I’m still coughing a week later and found out that the camera malfunctioned so we don’t have any pictures from the first few days. Not the best end to a great few weeks. So, today is a perfect day to receive this in the post. (Not the best photo – see earlier comment about stupid camera!) I first spoke to Melissa at Holmes-made about commissioning this piece before Christmas but didn’t get around to sorting out the details until months later. 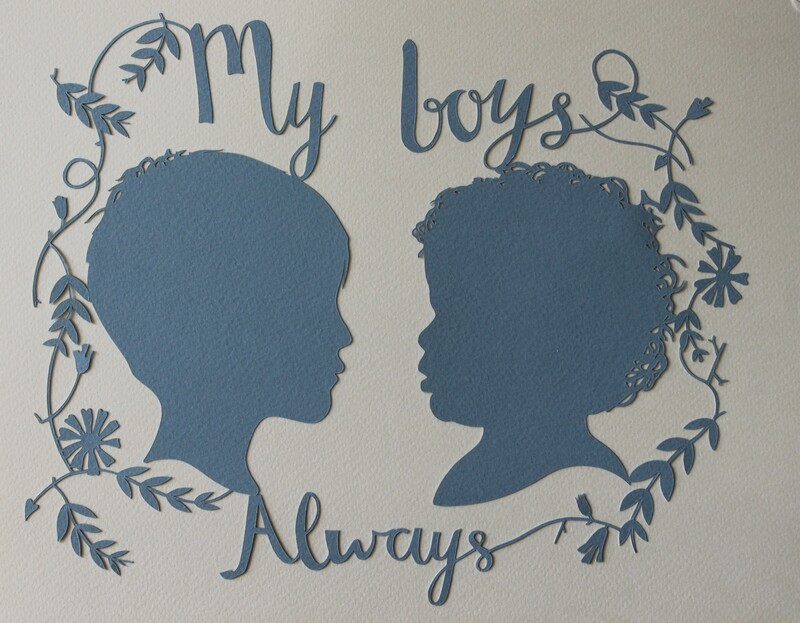 I wanted a bespoke papercut of my boys. Something to remind me that no matter what happens in the future, they will always be perfect and beautiful in my heart. MPS can steal so much from families, but it cannot steal that.